Dana Bowerman walked out of a federal prison camp in Bryan, Texas, Monday morning and for the first time in more than a decade, she chose her own breakfast. "I had five pieces of different kinds of pizza," Bowerman told All Things Considered in an interview. "Been waiting 15 years for that. I about choked though because I got kind of emotional and I&apos;d have a mouthful of pizza ... and it still feels very surreal." Bowerman is one of about 6,100 inmates released over the past few days as part of a change in the way the U.S. punishes people convicted of federal drug crimes. She was a first-time, nonviolent offender who got sent to prison in 2001, at age 30, for taking part in a conspiracy surrounding a methamphetamine ring. Under the sentence in place at the time, Bowerman had been scheduled to serve 19 years and seven months, or until 2018. "A lot of wasted time, I think," Bowerman said. "The money that was spent to keep me in prison all this time could have been better used for drug education and rehabilitation because I needed to get clean, and I needed to change my way of thinking, and I needed a good seven years to do that. ... You couldn&apos;t have convinced me when I walked in the door that I had any victims. But now I know that everything I did had a ripple effect, and everything I touched with drugs or my lifestyle affected the people they loved." Bowerman said she got clean in prison. And she said she&apos;s proud of her work there — talking to students about keeping straight and raising puppies, including Angel, who became an award-winning drug detection canine. The feeling of being free, Bowerman said, is still new. "I thought when I drove off the property that it would sink in but it still feels weird, different," she said about an hour after her release, in a hotel room surrounded by her mother, stepfather, sister and best friend. Bowerman had surgery over the summer for a persistent problem with her vision, so, unlike many other inmates, she couldn&apos;t take advantage of the option to leave the prison camp near College Station for a halfway house or home confinement during the last six months of her prison term. Bowerman said now that she&apos;s out, she&apos;s keeping close track of the rules. 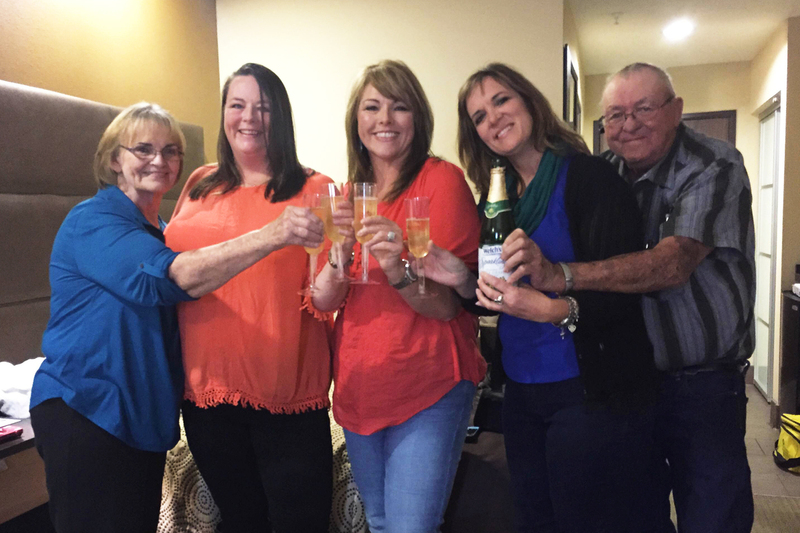 No alcohol, so her family toasted her release with sparkling grape juice. And she won&apos;t be able to travel beyond the rural area outside Lubbock where she&apos;s staying with relatives for at least two months. But Bowerman said when the time is right, she&apos;s eager to try to visit her father, a co-defendant in her prosecution. He&apos;s still behind bars. "I&apos;m hoping and praying and having faith that he&apos;ll receive his ... reduction also," Bowerman said. "Even if it&apos;s a one-time special visit, I haven&apos;t seen my dad in 15 years. I can&apos;t wait to hear his voice. I hope he calls today." Bowerman said she&apos;s looking forward to some solitude in her new home in the country "because there&apos;s never anywhere to be alone during prison." She said she wants to volunteer to talk to church youth groups to educate kids about the dangers of drugs. Once a straight-A student, Bowerman had no real obstacles in her way — except for herself. "I had curiosity and I had no responsibility and I had a selfish attitude and instant gratification," she said. "Now I see in hindsight how it changed all of my decisions." Bowerman also said she&apos;s looking forward to swimming and getting into shape. "I&apos;ve stayed to myself a lot, and I used food for comfort; now I&apos;m ready to get out there and get healthy and go swimming," she said. "I want to make my family proud. My biggest fear walking out those gates is that I will disappoint my family again. I can do time, I&apos;ve always been able to do time, but my family can&apos;t do one day more." She said she hopes the Sentencing Commission, the federal body that sets guidelines for federal criminal offenses, understands how much this second chance means to her — and to the 6,000 others who just won early release because of the commission&apos;s decision.